Fans of the superstar are expected to attend the event in huge number and the latest development about the event may make it even bigger. Mahesh Babu starrer Bharat Ane Nenu is gearing up for release this month end and the post production works are underway in super speed at the present moment. Mahesh Babu will be seen playing a Chief Minister in Bharat Ane Nenu and the journey of the politician forms the crux of the story in the film. Directed by Siva Koratala, Bharat Ane Nenu has a stellar cast which includes names like Prakash Raj, Posani Krishna Murali among many others. 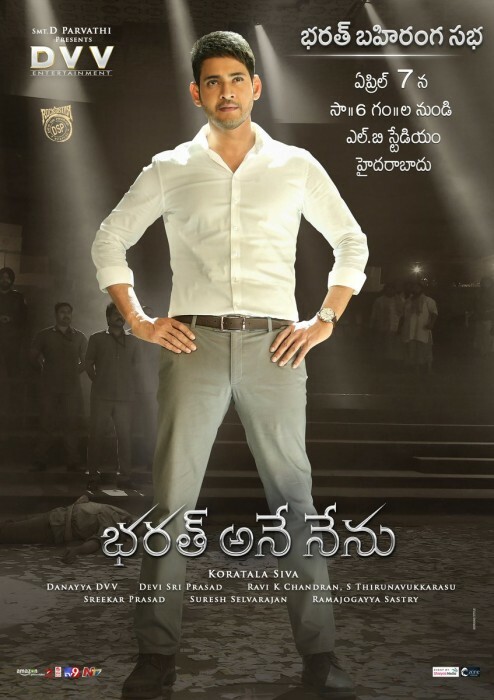 The makers of Bharat Ane Nenu confirmed a day ago that the pre-release event of the film will be held in Hyderabad at a stadium on the 7th of April, 2018 and will be open to all. Fans of the superstar are expected to attend the event in huge number and the latest development about the event may make it even bigger. Reports are doing rounds that actors Jr NTR and Ram Charan will attend the event as chief guests of the evening. The event is all set to be a star-studded event and will be one of the biggest events in Tollywood, if these reports are to be believed. Jr NTR and Ram Charan will soon be acting together in a multi-starrer to be directed by Baahubali director SS Rajamouli. The film is yet to be titled and is being produced by DVV Dhanayya under the banner DVV Entertainments. Interestingly, Bharat Ane Nenu is also being produced by the same banner and hence there is high probability that Jr NTR and Ram Charan will turn up for the huge event which is termed as Bharat Bahiranga Sabha. Bollywood actor Kiara Advani will be making her debut in Telugu with Bharat Ane Nenu while actors like Prakash Raj, Sarath Kumar, Rao Ramesh, Ravi Shankar, Posani Krishna Murali, Aamani, Jeeva, Benarjee, Brahmaji, Ajay Kumar, Sithara, Rajitha, Prithviraj, Devraj and Yashpal Sharma will be seen playing pivotal roles in the film. The music of Bharat Ane Nenu is being composed by Devi Sri Prasad, who has rendered tunes to all the films directed Siva Koratala so far. The camera of Bharat Ane Nenu is being cranked by Thirunavukarasu.